What is a bucket list travel experience? Celebrated world traveller Robin Esrock is author of The Great Global Bucket List One-Of-A-Kind Travel Experiences (Harper Collins) as well as numerous Canadian regional editions. He cites a night spent camping on the ice in Antarctica as a perfect example. Esrock fills the 400-plus pages of his latest book with many such experiences. Since he “went backpacking in 2005 and didn’t stop until 10 years later,” the pioneering blogger and Travel Channel and National Geographic International program host has visited over 100 countries on seven continents. His life is more domesticated now living with wife and family, but the South African expat still gets out and about. With the Great Global Bucket List outselling the top Lonely Planet title in Australia, he’s having to consider the possibility of repeating his hundreds of times criss-crossing Canada to write his book series Down Under. 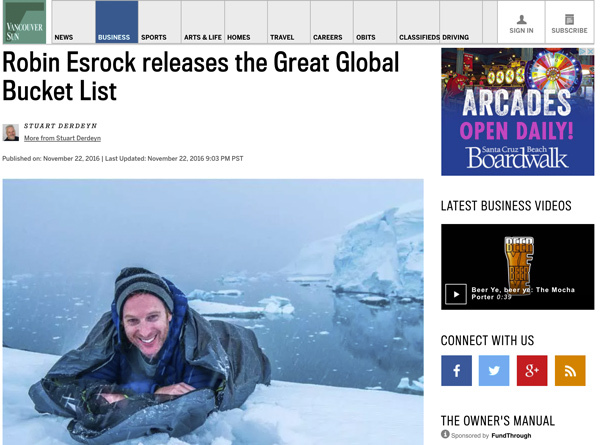 Esrock has 75 new chapters going into his next edition of the Great Canadian Bucket List. He is also writing a novel based around what he’s learned on the road. He’ll discuss this and more at his Jewish Book Festival presentation on November 27. .